This reader contains lines of Latin selections from Ovid poems, designed for students moving from elementary or intermediate Latin into reading the authentic Latin of Ovid. Introductory materials include an overview of the life and work of Ovid, bibliography, and description of Ovidian meters. Latin selections are accompanied by pre-reading materials, grammatical exercises, vocabulary notes, notes to assist reading comprehension, and other reading aids. Appendices on grammar and figures of speech, and a pull-out vocabulary of words appearing frequently in Ovid round out the book's innovative features. There's a gap between reading authentic Latin texts and a class that teaches Latin as a spoken language. "Ovid: A Legamus Transitional Reader" seeks to bridge that gap with material to help students understand the grammar and language used in these ancient texts, complete with a vocabulary practice and assistance. 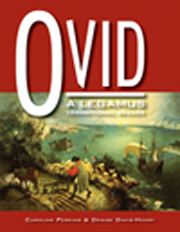 The ideal tool for any Latin student looking to practice their skills with the ancient language, "Ovid: A Legamus Transitional Reader" is highly recommended for community library collections dedicated to assisting in learning foreign languages.